As I grow in my leadership, I realize the importance of creating a daily routine that will drive my thoughts and actions for that day. What I do at the beginning of each day and throughout the day are very important to the others days, weeks and even months. What we think and do now, has a direct outcome on the future. I thought I would share what I do to ensure my heart and attitude are right for the day’s activities and the interactions with others. Here are 6 things I do every day to ensure I am fully prepared to succeed in whatever is planned or whatever unplanned events may come my way. Up By 4:30 AM – I get up early. I love being at the office and watch the sun come up. It seems to inspire me. Getting up at that time also allows me to complete the next 5 steps. In addition, scientific evidence has shown getting up early will: help your performance, make you more reliable, be more alert, stress less and loose more weight (not that you ladies need to). GET MY HEART RIGHT – I’ve come to know the great importance of beginning my day in prayer and reading the word of God. This prepares my heart and soul for the day activities. I spend 30-45 minutes doing this. It ensures I have the right mindset and attitude to interact and work with people, solve problems and to fully engage myself in the conversations and activities throughout the day. I spend a big part of my day providing coaching and at times guidance to fellow employees. My heart must be right, to give the right advice or coaching. PRIORITIZE – I have a list. Every morning I review it, add to it, subtract from it, move things up or down, write notes out to the side of some, put ? marks on others. I identify what is essential for that day. I prioritize for the days activities. However, I also spend a little effort and time to determine what items are critical for tomorrow’s activities and the weeks to come. I found the tI must not only plan for today but also the future. I also know the tI must realize that some things can b put off for another day. YOU CANNOT TACKLE EVERYTHING…….trying to will drive you mad!! Check your list multiple times a day and be flexible to re-prioritize as needed. PERSONAL GROWTH – If you don’t invest in yourself, then you can’t invest tin others. Part of my morning is spent reading listening or watching a video to ensure my grow as a leader and professional. I use to hate to read. Now, I just dislike it. But I also realized that reading stimulates my thoughts, ideas and affects my actions (consider what you read). It also stirs up a sense of adventure, encourages me and grows my vocabulary. Find what motivates you. But remember, this is your time, use it wisely. BUILDING RELATIONSHIPS – This is different from networking. Networking is positioning yourself within a professional setting through acquaintances . Networking is not relational, but can produce relationships. Relationships are investing in others. It is the glue that holds people together. Relationships allow you to build trust through adding value and eventually influencing. Spend your morning and time throughout the day to send that email or call that person and see how they are doing and what you might be able to help with. FOCUS, FOCUS, FOCUS – Distraction can be is disastrous!! Be sure and know when social media is appropriate and when your focus needs to be completing the task at hand. It seems these days that every free mental moment is used to accept friend request, check that snapchat picture or grow our linked network. Hey….that stuff will be there later. However, if you don’t perform it might mean you don’t have a job. I am very selective when accepting calls or emails. Every hour I will check my voice and email mails and respond to those that require my attention. Social media and conversations are reserved for breaks and lunches. Now understand, situations change and there are always exceptions to the rule. 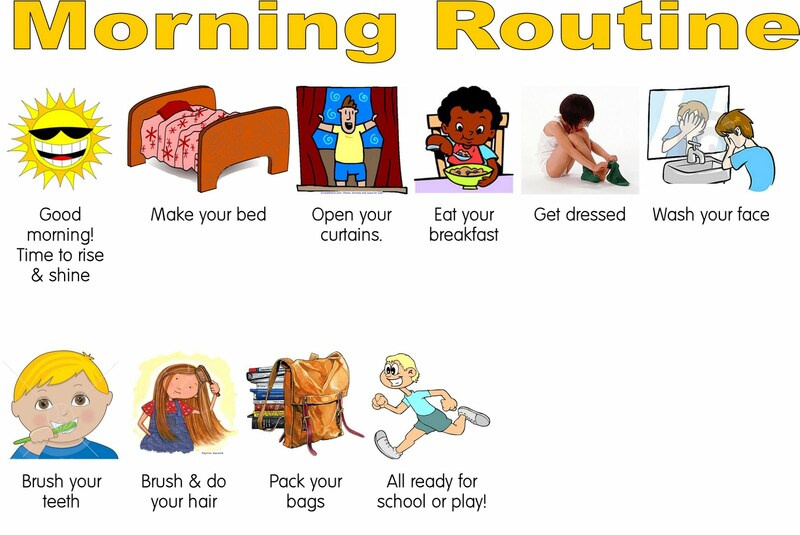 have a routine and you will benefit from it.